You are here: Home / Community / Workforce / Workforce Training / Need Training? Tonn and Blank Construction apprentices Chris Stuek, left, Karringan Scheffer and Vincent Czarnecki, right, work on a project for the Michigan City company. Apprenticeship programs have been part of the company’s labor force since its inception, says Jon Gilmore, president and CEO. Technology has changed the way we do business, but the need for qualified talent has remained constant. Local experts in the field of workforce development and employers who are reaping the benefits of better-trained labor say the present and future of the regional labor landscape will continue evolving because business needs routinely change. Linda Woloshansky, president and CEO with the Center of Workforce Innovations Inc. in Valparaiso, says her organization advances both the causes of workers and employers in the Region. “We are a workforce development organization that finds solutions to issues keeping people behind in finding work and helps employers overcome issues keeping them from finding talent and expanding,” she said. To that end, they employ a “spectrum of strategies,” with skills development and placement into jobs being the main focus. This in turn allows companies to hire and maintain talent. 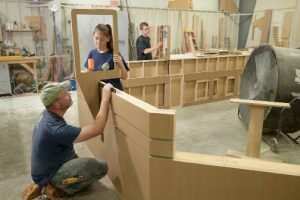 What makes apprenticeships unique is that they allow for a “combination of experiential learning with a company and academic training,” because apprentices are usually working on an associate degree while on the job. Tonn and Blank Construction in Michigan City is one employer that has benefited from apprentice labor. That’s because the apprentice gets paid on-the-job training while earning a degree, and the employer gets the advantage of having access to lower-cost labor and a “well-trained workforce at your fingertips.” In turn, he says his company can pass that savings on to their clients and parent company. Gilmore said his company has what he refers to as an “optimal mix of journeymen and apprentices” on job sites. He says this allows more seasoned contractors to scout for up-and-coming talent and maybe place them in specialty roles, including layout technology. Speaking of specialty, Gilmore said an apprenticeship in the trades is unique because it exposes them to various skilled trades and work settings, so they can decide what they want to pursue after graduation. According to Woloshansky, employers in industries outside the trades can benefit from innovative programs such as the Midwest Urban Strategies’ partnership with CVS Health. Wolsoshansky is a board member with the organization and has seen great growth come from the partnership’s efforts in a short time. Midwest Urban Strategies represents a coordinated effort between 12 Department of Labor Region 5 urban workforce development boards to marry traditional workforce development practices with economic development. Woloshansky refers to the partnership with CVS Health as a “well-developed apprenticeship model where individuals are oriented to the business.” With this on-site model, apprentices in Indiana can learn the ins and outs of all the aspects of the business, she said. “CVS wants their folks to have a good understanding of how their business works,” Woloshansky said. Woloshansky is optimistic that apprentices (and perhaps future employees) have a broader skillset and knowledge base. And these are the kinds of skills that can be translated to other types of jobs, too. In a November 2017 statement, CVS Health said it had set a goal of hiring 5,000 new apprentices by 2022. Dr. Michael Hicks, a professor of economics at Ball State University, said the Midwest Urban Strategies model has the most promise for Indiana because it’s more likely to stand the test of time. 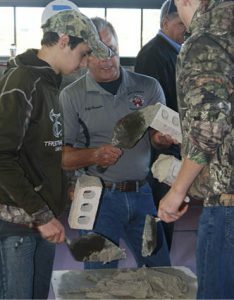 Representatives with the local bricklayers apprenticeship program work with high school students in November during the 2017 Construction and Skilled Trades Day program at the Lake County Fairgrounds in Crown Point. He provided a real-world example of a bricklayer. While the established profession will likely not survive automation, the skills needed to perform this task will always be in demand. That’s why a firm command of middle-school math and science is so vital, Hicks said. Educating and empowering youth is one thing, but Woloshansky’s organization wants people to feel confident they can learn, even mid-career. She said sometimes workers feel “frozen” and are stuck in a role where they have little or no opportunity to advance. “In Northwest Indiana, we want to develop a learning community for employment purposes,” Woloshansky said. That means encouraging workers to look to school systems, nonprofits, government agencies, higher education and other sources for ways to advance and thereby increase earning potential. Esperanza Ministries, a nonprofit stakeholder, has used training dollars to its advantage. Working alongside local municipalities, churches and community partners, it provides a safe and caring space to serve the physical, educational and spiritual needs of its clients. CHWs are usually entry-level, but they are charged with a great deal of responsibility, Hart said. Esperanza Ministries and partners from the private sector developed a program to “skill up” the Hispanic population while meeting the need for community health workers. This work was done in collaboration with the Indiana Minority Health Coalition, Indiana Community Health Worker Association, HealthVisions Midwest, Ivy Tech Community College and Saint Mary-of-the-Woods College. In 2017, 100 Hispanic participants were trained, certified and placed in community health worker positions in both health care and manufacturing settings. Additionally, participants received mentoring and English language training throughout their learning process. This program was introduced in Marion, Lake, Allen, Tippecanoe and Clark counties, areas with the highest population and unemployment rates for Latinos. Focusing on Hispanics was strategic because this segment of Indiana’s population has an above-average unemployment rate compared to the state average and experiences a significantly lower-than-average personal income, as well as a lower post-secondary degree attainment. The state’s Skill Up Grant provided the basis for ongoing certification classes, which will assist in filling the overall health care profession’s skill gap in Indiana and afford opportunities to one of the state’s most rapidly growing populations. In reviewing the results from the yearlong pilot, Hart said the grant was successful as employers were pleased with the results. Latino community health workers’ knowledge of the culture of the communities in which they serve can prove to be invaluable for health care providers. On the government front, Woloshansky points to the state’s Next Level Jobs initiative as a potential avenue for both employees and employers looking for financial resources. Next Level Jobs is part of Gov. Eric Holcomb’s Next Level Indiana agenda to skill-up workers. The state is shifting its focus to high-priority industries and high-demand jobs driving Indiana’s 21st century economy forward. Information from Nextleveljobs.org notes the 2017 General Assembly approved funds for Indiana’s Workforce Ready Grant program to provide free training for working-age residents in the state’s highest demand jobs. These industries have higher median salaried jobs and are rapidly growing in Indiana, including advanced manufacturing, building and construction, health and life sciences, information technology and business services, and transportation and logistics. Employers also can take advantage of the Employer Training Grant program from the Indiana Department of Workforce Development. Employers in any high-demand business sector can be reimbursed up to $5,000 for each new employee who is trained, hired and retained for six months, the state said. The caveat is that newly trained employees must see a wage gain as a result of new training; however, there is no wage requirement for new-hire trainees. There is a $50,000 cap for each employer and the jobs must be middle-skill, high-demand and high-wage jobs that require more than a high school diploma but less than an associate degree, the state said. Some experts believe job training should start in high school. Woloshansky said career education and tech centers are effective because they reach people at a critical age. “These centers are typically working with juniors and seniors in high school to provide them with different pathways (for learning),” she said. Internships are another outlet that can benefit both parties. “So, there’s so much available to people and employers to take advantage of,” she says about workforce development opportunities in the Region. 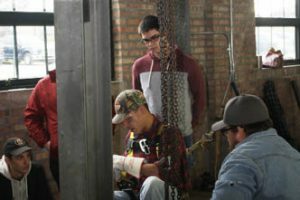 Hundreds of high school students from around the Region learned about various trades at the 2017 Construction and Skilled Trades Day program at the Lake County Fairgrounds in Crown Point in late November. Representatives with the local Ironworkers apprenticeship program are shown working with students. The Center of Workforce Innovations and several community partners are on a mission to “accelerate educational attainment levels and create a new culture of education in the region,” according to the 2016 State of the Workforce and Economic Indicators report released by the Northwest Indiana Workforce Board. The board is comprised of business, education, labor, community and economic development leaders responsible for the strategic vision of workforce development and governance of the one-stop system in Northwest Indiana. Valparaiso-based Regional Education and Employer Alliance for Developing Youth in Northwest Indiana (or Ready NWI) and its partners are addressing this issue head-on. The “Big Goal of 60 percent post-high school credential attainment by 2025” requires the 39.7 percent of adults in Northwest Indiana with higher education credentials to reach the 60 percent level projected to be needed by the Region’s employers. To meet that goal, Ready NWI’s efforts include a focus on “key stages of development of the student talent pipeline middle school to high school, high school to college, and college to jobs in our region. Ready NWI is equally focused on adult workforce advancement, in the form of acquiring new skills and credentials. That’s why during the next 10 years, the organization is committed to an annual review of progress across core indicators, including high school graduation, college remediation trends, college and university enrollment, and college and university awards. Click here to read more from the Aug-Sep 2018 issue of Northwest Indiana Business Magazine.